2 bedrooms, 2 bathrooms, living room, kitchen, dining area, deck with outside shower, off street parking. MW, DW, W/D (cold water laundry), 3 Cable TVs, DVD, WiFi/DSL, POOL PRIVILEGES @ DAYS INN, *GAS GRILL*, NO PETS, NO SMOKING. BEDS: 1 King, 2 Single, Sofa Bed. Accommodates 6.
close to beach and in an inactive area, the whole island is laid back. We love this property and will return! Well kept and functional; clean and light. Love the Brice Lane kitties and deer, and proximity to beach, too. The Krewer home is a perfect place for your Jekyll Island stay. Charming, well-maintained, close to the beach and other activities, you will find it to be extremely comfortable. Location was perfect. Nice quaint rental. Short walk to gorgeous beach. Just wish rental had a few more items stocked by owner. Simple things, like toilet paper, salt & pepper, saran wrap, classic DVD's to watch, more than 1 usable skillet. Washer didn't work either, but, we survived without it. Did have a nice little herb garden though (that we realized on almost the last day). Nothing fancy, but, very much what my friend & I were looking for. Probably would rent again next year. Wonderful week. We've stayed at Krewer before and will do so again. It is perfect for our needs. We are a longtime repeat customer as we love this place. The location is great. Love the place. Planning on returning next year. 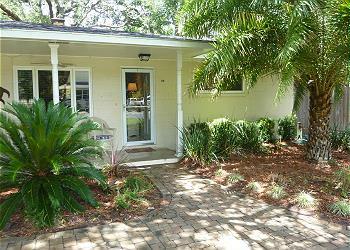 We have rented through Jekyll Realty for many years. The staff is professional and friendly. Always strive to make your vacation a great experience and follow up during your stay to make sure everything is okay. This was our first time to stay at Krewer and it was fantastic! Very close to the beach and pool. My grandchildren had a wonderful time! The unit was very clean. Kitchen was well stocked with necessary pots, pans, dishes, etc. Back yard area was great. Highly recommend this unit. Looking forward to next year.